* During this period the first English-language newspaper was launched under British-ruled Tenasserim, southern Burma. 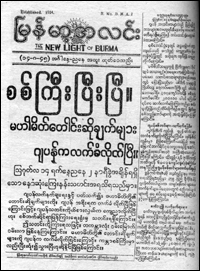 The first ethnic Karen-language and Burmese-language newspapers also appear in this period. March 3, 1836—The first English-language newspaper, The Maulmain Chronicle, appears in the city of Moulmein in British-ruled Tenasserim. The paper, first published by a British official named E.A. Blundell, continued up until the 1950s. 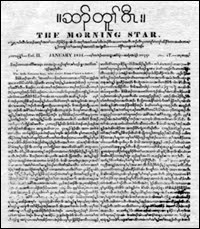 September 1842—Tavoy’s Hsa-tu-gaw (the Morning Star), a monthly publication in the Karen-language of Sgaw, is established by the Baptist mission. It is the first ethnic language newspaper. Circulation reached about three hundred until its publication ceased in 1849. 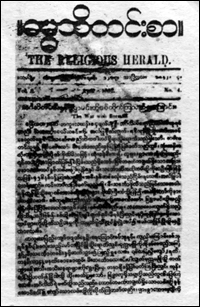 January 1843—The Baptist mission publishes a monthly newspaper, the Christian Dhamma Thadinsa (the Religious Herald), in Moulmein. Supposedly the first Burmese-language newspaper, it continued up until the first year of the second Anglo-Burmese War in 1853. In 1862 the paper resumed publication under a different name, the Burman Messenger. 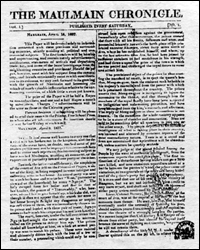 1846—The Maulmain Free Press newspaper is published by an English merchant in Moulmein. * About four English-language newspapers emerge. One is published by ethnic Arakan in the capital of Sittwe, Arakan state. The British legislation council enacts a law, known as the “law to shut mouth” banning the publication of news without prior approval. July 1, 1848—The English-language paper, the Maulmain Advertiser, is published in Moulmein. It may have first appeared as early as 1846. The paper, published three times a week by W. Thomas & Co, altered its name to the Maulmain Times in 1850, but the following year it resumed its previous name. 1849—A weekly publication, the English-language Friend of Burmah newspaper, starts in Moulmein. January 5, 1853—The Rangoon Chronicle newspaper is published twice a week. Later, it changes its name to the Pegu Gazette. It ceased publication in May 1958. 1853—The twice-weekly English-language Akyab (Sittwe) Commercial Advertiser is published in Sittwe, by Arakan Weekly News Press. 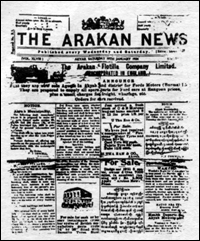 The following year, the paper changes its name to the Arakan News. Circulation reached about 150. June 13, 1857—Lord Canning, the Governor General of India from 1856-1862, introduces a law banning the publication of any news without prior approval in an attempt to regulate the press. * At least three new newspapers emerge. There are six newspapers being published during this period. June 2, 1858—The English-language Rangoon Times is published, possibly as early as 1854. The newspaper began as a twice-weekly publication, however, it increased to three times a week by 1861 and later became a daily. It ceased publication in 1942, when the British left Rangoon. 1861—The Rangoon Gazette is established as a rival of the Rangoon Times. It is published twice a week and later daily. It ceases publication in 1942. 1862—The Dhamma Thadinsa (the Religious Herald), first published by the Baptist mission in 1843, changes its name to the Burman Messenger. The Times Commercial Advertiser, the Daily Advertiser, Pole Star, British Burma Gazette, the Mercantile Gazette and the Arakan News are still published during this period according to newspaper research conducted in 1868. * Freedom of the press is guaranteed by King Mindon, the second last Burmese monarch, in an Act of 17 articles that is regarded as Southeast Asia's first indigenous press-freedom law. The Kingdom publishes an official newspaper. 1869—Myanmar Thandawsint Thadinsa (the Burmah Herald) is published once a week by Myanmar Thandawsint Press, possibly as early as 1871. It is the first Burmese-language newspaper in Rangoon. In 1884, it becomes a daily with a circulation of around 500. It ceases publication in 1912. May 8, 1871—The Burmese-language paper, the Burmah Gazette, appears in Rangoon. This weekly newspaper alters its name to the Burma News in May 1872. It ceases publication in 1916. January 11, 1873—Law-Ki-Thu-Ta (the Worldly Knowledge) newspaper emerges in Rangoon. November 1874—The Burmese-language Friend of Maulmain newspaper appears in Moulmein. August 15, 1873—King Mindon (1853 – 1878) bestowes immunity on the local press corps with the introduction of an act consisting of 17 articles that ensure freedom of the press. 1875—Yadanabon Thadinsa (British Burma News) appears in Rangoon. 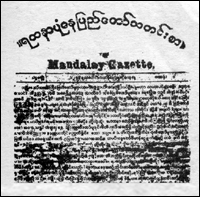 March 20, 1875—Yadanabon Nay-Pyi-Daw (with the heading of Mandalay Gazette in English on the masthead) is published weekly by King Mindon, possibly as early as 1874. Publication ceases in 1885 when Upper Burma is annexed by the British. 1876—The Burmese-language Tenasserim Thadinsa (The Tenasserim News) appears in Moulmein. 1878—The Burma Herald is set up by the King of Mandalay to counter the pro-British views of Rangoon newspapers. Two other English newspapers, the Rangoon Daily Mail and the Daily Review, are established and halted six months later. March 11, 1878—The British government enacts a law called the Vernacular Press Act to ban newspapers from reporting and picturing defamation of the government. * King Thibaw, the last Burmese monarch, is removed and Upper Burma is annexed by the British. One of the most outspoken newspapers,HanthawaddyThadinsa, is established along with some other new newspapers. 1884—The English-language weekly, the Maulmain Almanac, is published in Moulmein. The Burmese-language Friend of Burma is also set up in Rangoon and eventually becomes a daily newspaper before its publication stopped in 1929. 1886—The Mandalay Times newspaper appears twice a week in Mandalay. March 3, 1887—The Mandalay Herald emerges three times a week in Mandalay. It becomes a daily in 1899 up until 1902, when the paper stopped being published. 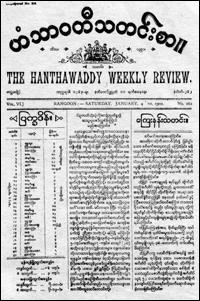 1889—The Hanthawaddy Thadinsa (the Hanthawaddy Weekly Review) appears twice a week in Rangoon. It is regarded as one of the most outspoken newspapers of its time. The newspaper covers foreign news from Reuters news agency through an agent. In 1904, its circulation reaches about 1,000. 1892—The English-language papers, the Daily Advertiser, the Arakan Echo and the Arakan Advocate are established in Sittwe. Later, the Daily Advertiser and the Arakan Echo combine to form the Arakan Times. 1894—The English-language newspapers, the De Vaux Press Advertiser, the British Burma Advertiser, the Rangoon Commercial Advertiser and the Burma Chronicle News are all being published in Rangoon. De Vaux Press Advertiser’s circulation was said to be around 1,000 a day. The Karen National News, the Bassein Weekly News and the Advertiser are also published weekly in Bassein, Irrawaddy Division. The Karen National Newswritten in the Karen-language of Sagu (Sgaw) reaches circulation of about 500. February 1895—The Mawlamyaing Myo (MoulmeinTown) is published in Moulmein. 1899—The Times of Burma and the Upper Burma Gazette are established in Rangoon and Mandalay. 1900—The pro-British Burmese-language Star of Burma is published in Mandalay. It continues to be published up until 1948. * Reuters News Agency opens in Rangoon. Other outspoken newspapers appear, such as the Thuria (the Sun). By 1904, there are about 15 newspapers running with circulations of up to 1,500. New newspapers continue to be established. March 3, 1901—The religious Maha-Bodhi News appears once a week in Rangoon and continues to be published up until 1926. 1903—A Reuters News Agency office opens in Rangoon. July 22, 1903—The Myanmahitakari Fortnightly Journal is established. August 2, 1904—The Burma Printer News emerges three times a week in Rangoon, but is stopped three years later. April 1907—The Burma Critic begins publication in Mandalay. In the same year, a religious newspaper with the name of Dhamma Day-Tha-Nar Thadinsa appears. May 18, 1907—The Burma Echo appears once a week in Rangoon. November 1907—The Burma Educational Journal is established. 1908—The Burma Commercial Advertiser is published twice a week in Rangoon. 1909—The Dawkale, published in the Karen-language of Sagaw, is published once a week by Karen Magazine Press in Bassein, Irrawaddy Division. 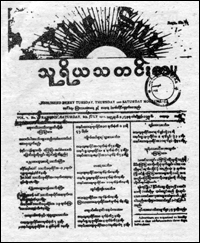 July 4, 1911—One of the most outspoken Burmese-language newspapers, Thuriya (the Sun), emerges three times a week. In March 1915, it becomes a daily newspaper and continues to be published until October 14, 1954. In the same year, the Salween Times appears in English. The Rangoon Gazette, the Rangoon Times, the Friend of Burma, the Rangoon Advertiser, Publicity, the Maha-Bodhi News, the Burma Herald, the Burma Printer News are all published in Rangoon. The Upper Burma Gazette, the Mandalay Herald, the Star of Burma, the Mandalay Times, Moulmein Advertiser, Moulmein Gazette and the Burma Times are all published in Mandalay. * One of the longest-running newspapers, still being published by the junta today, Myanma Alin (the New Light of Burma), appears in 1914. Associated Press of India, known as API, opens an office in Rangoon and a Muslim newspaper also emerges. August 1914—Myanma Alin (the New Light of Burma), an outspoken newspaper, appears no later than May 1919. It is published three times a week in Burmese. In December 1924, it becomes a daily newspaper until its publication ceases in 1929. 1914—Thuria and Myanma Alin publish a newsletter called War Telegrams about World War I. Thuria's circulation reaches about 10,000. 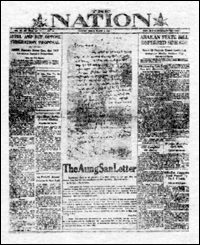 1917—The Burma Guardian and the Rangoon Mail are published in Rangoon. The Tharrawaddy Record is set up in a town near Tharrawaddy, central Burma, with a female editor. 1918—The Knowledge (Pyinnya Alin) and the Burma Observer are published in Rangoon. The paper is halted in 1924 and again in 1929. May 1919—Myanma Alin Thadinsa Athit (a second New Light of Burma) is published in Rangoon. 1920—The New Burma is set up in Rangoon and continues to be published until 1942. 1921—The Home Rule is published in Mandalay. March 1922—The Press Law Repeal and Amendment Act is enacted. The act allows the authorities to confiscate any newspaper that runs news and opinion pieces considered as instigating revolt against the government. 1921—Burma’s Progress is published by the British government but stops two years later. 1922—The Karen Times and the New Leader appear in Rangoon and Mandalay. The following year, the New Leader changes its name to Shae-saung. In October, the Servant of Burmaemerges in Rangoon. The Myanma Myo Taw Saunt and Aungzeya newspapers also begin to be published. 1923—The Muslim Herald, the Comet, the Burmese Review and the Myanmahlut News are established. Fair Play (in Karen and English), the Rangoon Daily News and the Irrawaddy Times (in Burmese and English) are already being published. The Wunthanu (the Patriot) is also published in Rangoon with a circulation of around 5,000. 1923—The Associated Press of India, known as API, opens an office in Rangoon. 1923—According to an official statement, there are 31 newspapers being published in Rangoon, Mandalay, Moulmein, Sittwe, Bassein and Tharawaddy. * About 40 new newspapers emerge, tripling the number of papers since the press laws of 1908 and 1910 are repelled and amended. 1924—The Burmese-language Yarmanya and the Myochit newspapers appear in Moulmein and Rangoon. 1925—The Independent Weekly, the Truth, the Market Report, the Victor (Zeya), the Trades Exchange and the Silver Moon come out in Rangoon and Mandalay. 1926—The Myanma-Myo-Nwe, Aung Myanma, Mawrawadi News, the Shwe Pyi, the Ledi Religious Instructor are published in Rangoon. 1927—The Bandoola, the Traders Spectacles, the pro-British Headman’s Gazette, Essence of Buddhism and another Dhamma newspaper emerge in Rangoon. 1928—The National Observer and the Shwenannyun Gazette are published in Rangoon and Mandalay. 1929—Kesara, the Burma Advertiser, the Burman and the Mandalay Daily Supplement to the Sun are set up in Rangoon, Mandalay and Moulmein. 1931—Ratanathiha and Lawkasara Daily News come out in Sibaw, ShanState and Rangoon. 1932—Tharrawaddy, Anawyahtar, the Myanma Zeyyar, the Ma-Haw-Tha-Dha and the Rangoon Optic newspapers emerge. 1933—Myanma Myochit, Daung-Settkya, the Laborer, the Success, Daung, the New Mandalay Sun Daily and the Evening Report appear. * More than 60 newspapers emerge across the country, including Japanese-language and ethnic newspapers. 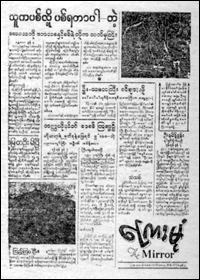 1935—The Rakhine-Pyi-Thadinsa, an Arakan newspaper, is published in Sittwe for four years. Ye newspaper, the Myanmar Uzun, the Burma Daily Mail and the Burmese Improvementcome out in Rangoon and Mandalay. 1937—Doat-Let-Yone (the Arm), claiming to be the only Arakan-language paper, is published in ArakanState. Asariya and the 10, 000, 000 (the Ten Million) are set up in Rangoon. 1938—The Progress, the Aazaanee, Burma’s Voice, the Deedok Daily and the Leader emerge in Rangoon and Mandalay. The editor of Deedok, Ba Cho, is assassinated together with national leader Aung San on July 19, 1947. 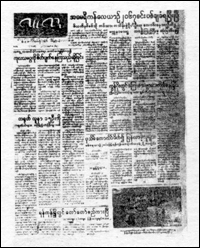 1939—The Advance Daily, the Burmese News Mandalay, the Shwe Pyi Daw (Burma News), Thakin Thadinsa, the Local Bodies, Lu-Nge-Let-Yone Daily and the Nationally Daily are published in Rangoon and Mandalay. 1940—The Mon Bulletin, the Student, World Telegrams Daily and Saturday News are published in Rangoon and Mandalay. 1941—A Christian newspaper, the Sower and the Daily Mirror appear in Rangoon. 1942—The Tavoy Daily appears in Tavoy. The New Light of Burma and the Sun emerge again. Bamakhit and Mandalay Thuria appear. September 1942—Domei News Service publishes a Japanese daily newspaper. 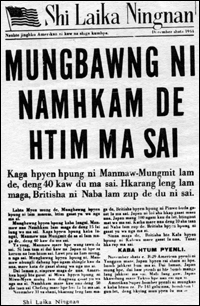 1943 - 1945—Kanbawza newspaper, the Kachin-language Shi Laika Ningnan, the Rangoon Liberator, the Shwe Man Aung Si, Tai-4, the British government published New Age, the Tavoyan, the Lanhnyun Daily, the Freedom, the Morning Star, Burma Economic Daily, the People's Voice and the Guide Daily are all in circulation. Kachin’s Shi Laika Ningnan is printed in India and airdropped into the Kachin-inhabited area of northern Burma. * About 70 newspapers come out during this period. 1947—Burma’s first constitution guarantees citizens the right to freely express their opinions and convictions. This gives the country a reputation for having one of the freest presses in Asia. 1948—Burma gains independence. There are 39 newspapers published in various languages throughout the country. Seven of the papers are printed in English, 11 in foreign languages, five in Chinese and six in Gujarati, Urdu, Tamil, Telgu and Hindi. April 16, 1957—The Mirror Daily, the Reporter Daily and the Pyidawsoe News Daily appear on Burmese New Year day. * About 30 newspapers emerge. The year 1964 is said to be Burma’s last year of press freedom. At this time, dictator Ne Win's Revolutionary Council shuts down some newspapers and nationalizes most newspapers. 1962—The Burma Press Council, or BPC, is founded “to promote and preserve freedom of the press through a voluntary observance of a code of press ethics.” Writers and journalists from 52 newspapers, journals and magazines signed the BPC Charter. Later that year, the Dictator Ne Win’s Revolutionary Council revokes all existing press laws and enactes a single law, the Printers and Publishers Registration Act. The act establishes Press Scrutiny Boards to scrutinize all material prior to publication, or in some cases after publication. 1963—The military government closes down the Nation, an outspoken defender of press freedom, arresting its editor Law Yone three months later. July 1963—The government establishes the News Agency Burma. October 1963—The government launches the Loktha Pyithu Nezin (the Working People's Daily) to compete with exiting private newspapers. In January 1964, the English version of the Working People’s Daily appears. 1964—Said to be the last year Burma enjoyed a free press, the government nationalizes all private newspapers, the liberal Kyemon (theMirror), Botataung (A Thousand Officers) and theGuardian. The left-wing Vanguard offers itself for nationalization. Smaller newspapers are shut down and several editors and journalists are arrested. 1966—The government announces that private newspapers are to be banned altogether.All Chinese and Indian language newspapers are stopped as printing is required to be done in Burmese or English language only. 1969—The right-wing Hanthawaddy and the Myanma Alin (the New Light of Burma) are nationalized. Eventually, only six newspapers are left: the Loktha Pyithu Nezin, the Botataung, the Kyemon and the Hanthawaddy, the Guardian and the Working People’s Daily. The News Agency Burma controls the flow of news in and out of the country. All foreign correspondents, except those working for the Soviet Tass and China’s Xinhua, are expelled. Visits by foreign journalists are officially banned. Locally based foreign news agencies are forced to appoint Burmese citizens as correspondents that must be approved by the authorities. In the late 1990s, the British Broadcasting Company and the Voice of America pull out after being unable to appoint their own correspondents. * In 1988 Burma enjoyed press freedom for the short time of one month due to pro-democracy uprisings. In 1997 Burma was labeled as the regions number one adversary of the press. Today, it has about 100 publications, all censored by Press Scrutiny Boards. August - September 1988—After 26 years of silence, about 40 independent newspapers and journals, including the Light of Dawn, the Liberation Daily, Scoop, the New Victory andNewsletter, appear in Rangoon for about a month during the period of nationwide pro-democracy uprisings. The publications run political commentaries, biting satires and humorous cartoons of the rulers. Even the state-run newspapers like the Guardian and the Working People's Daily publish outspoken political articles. September 1988—Immediately after the military ceases power on September 18, all newspapers are banned except for the Loktha Pyithu Nezin and its English version, the Working Peopl’s Daily. Strict censorship is imposed and many journalists are arrested. At first, foreign journalists are allowed into the country but later they are banned and only a few selected foreign journalists are given press visas. 1989—After taking power again, the military amends the 1962 Printers and Publishers Registration Act to heavily increase the fine payable by offenders. 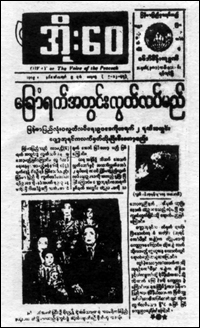 April 1993—The regime changes the name of the Loktha Pyithu Nezin (the Working People’s Daily) to Myanma Alin (the New Light of Myanmar) that was banned in 1969. Mid-1990s—The junta launches the Kyemon that was also nationalized in 1964. 1997—US-based Committee to Protect Journalists, or CPJ, describes Burma and Indonesia as the region’s two foremost enemies of the press. Yet, since the fall of Suharto in the same year, Indonesia’s mass media blossoms, leaving Burma as the region’s number one adversary of the press. February 2000—The English-weekly Myanmar Times & Business Review is launched by an Australian businessman and military officials. Sonny Swe, the son of Brig-Gen Thein Swe who is a high ranking Military Intelligence officer, is the deputy CEO of the journal. Later, it starts to publish a Burmese-language version. April 28, 2004—An international pro-democracy group, Freedom House, ranks Burma as one of the top five “Worst of the Worst” countries for press freedom in the world. This chronology was posted May 3, 2004—Newspapers during the period of the 1940s-1960s will be updated at a later stage.